How can city games staged in public spaces activate citizens around the theme of the circular economy? That was the central question explored in the Games for Cities training school and game jam that took place October 10-14 in Amsterdam. The event was organized as part of the Games for Cities project, in close cooperation with the Play & Civic Media research group at the Amsterdam University of Applied Sciences and the EU COST Action TU 1306 Cyberparks. During the event 20 students, game designers, architects and urban planners from a broad variety of countries were teamed up in five interdisciplinary groups to design games or playful installations for public space. These games were to address the needs of five existing issues or projects centered on the circular economy, introduced by local entrepreneurs and researchers from Amsterdam and Utrecht. 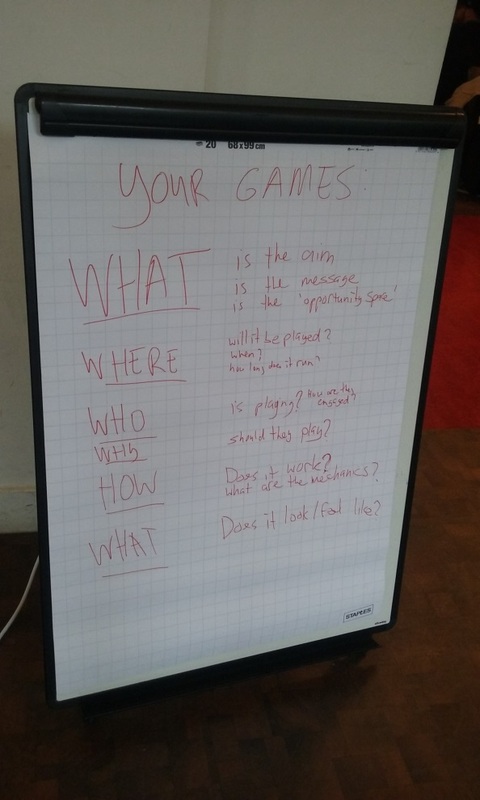 In this article I present the initial findings, based on observations of the workshop process, the team presentations during the game jam and the final products. Before we move on to the projects developed in the workshop, I will first outline the general theme for – circularity – and the specific urban issues that had to be modelled. An existing gamified project dealing with plastic recycling in a plastic-ridden neighborhood needed a new impetus to increase its uptake and scope. More citizens had to be made aware that buildings are full of resources such as metals that can be reused after demolition. As part of a research project, the NoordOogst area required a system to promote a circular economy in organic waste disposal among the different participants. Using gathered data on the air quality in Amsterdam, citizens had to be made aware of the current state of the air. With water levels rising and shortages occurring elsewhere citizen must be alerted of his/her own role in the management of water. All of the groups had to find out a way to use games or play to start thinking about complex urban issues, yet every group set out to tackle their problem in a different manner. At the same time we could observe some commonalities in their approaches when modelling urban issues into games. While too early to call this common language, these initial findings provide some interesting discussion points. The first processual aspect of the modelling was found in the approach to the problem. Whereas for many game designers “a large part of [their] role is to keep [their] concentration focused on the player experience” (Fullerton 2008, 2), games for cities require modelling of urban issues and thus spring from a conception of the problem. All of the teams started with an interrogation of the local stakeholder to determine what exactly is the problem they want to see addressed. Sometimes the demands of the contractor were specific – raising awareness about urban mining for instance – but at other times it was more exploratory, such as looking for ways to use bountiful data on air quality. The teams first approached the issue as a problem-solving project: they went looking for the underlying problem. The plastic recycling issue, which had as larger problem that the scope and reach needed an impetus, was boiled down to the absence of visualization of the recycling result. This provided a focus point for the designers and determined their scope. Like a project manager, the teams focused on the particular dimensions of the problems and only then would they see how games could be designed for this. This attention to underlying problems could be considered an important focus point when designing and evaluating urban games. Being on site will familiarize you with the stakeholders directly involved. This insight can determine who your players will be or it can further define the problem. The RE-ORGANISE team for instance found out that the entrepreneurs working in the NoordOogst area have some different ideas about the circular economy than the Hogeschool van Amsterdam. This allowed them to adapt the specificity of the issue they were supposed to address. Going to the locus of play will also show what you have to work with. According to designers Youn-Kyung Lim, Erik Stolterman Josh Tenenberg “what determines the specifics of how to form [games] and what [they] should be composed or made out of is the materials” (2008, 14). The elements present at the setting will limit and manifest the possible designs and interactions. The Air Quality group for instance found that on the Valkenburger- & Weesperstraat crossing – where the game would be set – the available assets were traffic lights, cars and roads, bikers and bike roads, and several open spaces in the field of vision of the bikers. Based on these materials and their associated characteristics (such as the time available in front of a traffic light, the width of the bike road, etc.) the Air Quality group went on to design a game that could be played in the time of a traffic light wait, catering to the movement of bikers over the path, with visual feedback in their field of vision. Getting a hold on the materials is then a key consideration when designing games for cities. Michiel de Lange explains that when making games for cities “a careful balance must be struck between simulating “real world” complexity and deliberate simplification (2015, 430).” The final processual practice exhibited by the teams was the communication of the issue in the game. The balance is determined by what is communicated to the player, and how.The teams’ urban issues required communicating a complex message, such as awareness of urban mining, a call to action for air quality, or responsible water use. This complexity was broken up into smaller pieces, some were left out completely, while some became the focus of the game itself. This abstraction was presented to the player. During the game jam three areas influenced this abstraction: assets, mechanics, and the nature of the message. These areas should be seen more as reflections on concrete game elements than processual practices. The first element that materialised the modelling process of the urban issues were the assets used. The urban mining team, for instance, determined that only some aspects of urban mining reality were necessary, so some of the material reality had to be filtered. Because of that, they determined that a virtual component was required that could act as a filter, translating some dimensions of the physical reality into a virtual layer. Physical space was abstracted into a version that characterized buildings as their resources. However, the team also complicated this model by adding social value as a metric. In order to raise awareness about urban mining, the team complicated their model slightly, to embed it more in reality. Communicating an issue through a game then requires an inventory of the salient and necessary assets. The second element stems from games’ characterization as interactive – the players have to actually do something. But what actions should the player be allowed to do and how do these relate to the issue? The teams all debated on what the exact goal and scope was that they tried to achieve. Depending on this goal, the mechanics – or player actions – were decided upon. But this translation of issue-sensitive actions and player actions is not a simple thing. The Air Quality team for instance ultimately made a game where the bikers had to make a choice whether to take a stand against pollution or not. This choice was made by parking in a particular spot in front of the traffic light. One may wonder whether this abstraction of ‘taking a stand’ into ‘choosing a space’ will convey the message best. According to game designer Miguel Sicart (2008) game mechanics matching the physical actions associated with performing it can invoke a stronger emotional response. Choosing a parking spot has no link to fighting against pollution however. The designers were aware of this and contextualized the action with further visual information. The mechanics should therefore be carefully chosen to fit the goal as well as tested for their reach. Finally the modelling serves a purpose: to convey a message or actions. The shape of this message should be decided upon. All teams shied away from a prescriptive lecturing of how to engage with an issue for they feared this would incite more resistance than awareness. As a result, most of the games designed are more playful installations than actual games. Players could experiment instead of following a linearly designed lecture. As Schouten et al. (2016) explain, urban issues are large, complex systems, with a variety of dimensions and interpretations. By abstracting the message into more open ended terms, urban issue games allow for flexibility regarding the city appraisal. The RE-ORGANISE team followed a different form of abstraction however. They distilled the model of the circular economy to a very simple model – a game where waste products had to be assigned to the proper recipient, thus forming a circle – and gradually increased the complexity of the model with each level reached in an app. This is a clear example of procedural rhetoric (Bogost 2010), where game mechanics – in this case the closing of the circular economy loop – can convey an argument – an understanding of the circular economy. This argument became more complex and detailed as the player continued. The team had thus fully embraced the educational goal of their issue and translated this into an incremental learning curve through puzzle games. This shows that conveying a complex message through a game then usually takes more iterations of the message, or even an explanatory contextualization. Following these considerations on the process of modelling urban issues into games as a way to start thinking about a problem the teams came up with different end products. The final product depended on the urban issue as well as the manifestation of the dimensions outlined above. From the final products, outlined below, the flexibility of the aforementioned heuristics that go into modelling urban issues into games can be discerned. The plastic recycling team had to start from an existing project that already had a gamified infrastructure. The challenge for their model then came from finding a dimension of that infrastructure that might benefit from games. Their game, Funplastic, had to bring the result of the existing recycling back into the community. Through an app players can collect coins by gathering plastic waste. These coins can be spent in a virtual shared marketplace to purchase products made from the collected plastic that serve communal use. A mission system and a story line will draw players in and keep them motivated. These events are calls to action while the app is the new impetus for the existing projects. This project shows the importance of figuring out differing demands of stakeholders, especially within an already defined system. The goal of the Urban Mining game was to raise awareness about the resources that can be recycled in buildings. The designers made a 30 minute event of an Augmented Reality mobile game with players walking past buildings. MetalKong – a huge ape – is on a rampage and metal is needed to build a cage. Players have to locate buildings that hold resources and grade them on a social use scale. After finding them all they can decide to recycle them, thus destroying the building and adding to the cage. Or they retain the building for social reasons but thus risking MetalKong’s release. This game implicitly also gathers data about citizen’s reaction to urban mining. It thus uses a second step to drive home their message. The Air Quality team designed a game around the material affordances of the space. On a polluted crossing bikers and car drivers compete for the safety of the city. 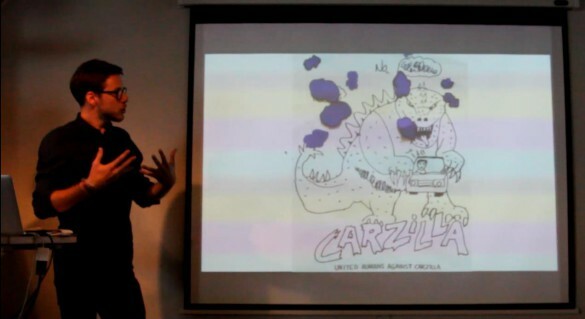 Carzilla is forcing car drivers to pollute the city. As the bikers approach the traffic light, their bike lane alerts them of the imminent choice: do they take a stand against air pollution (group left), or don’t they (group right). Opposite of the light is a display showing Carzilla’s health. Every car passing will power him up. Every biker on the left will whittle him down. Making use of the shared materiality, this game creates an aware community in a very short time. The water team had as goal to raise awareness of citizen’s responsibility for considerate water use. They relied on a physical object in the environment and experimentation to convey the message. They made a playful rain collector. Depending on the interaction with a series of levers and a swing, the water could either overflow (no action), drain (individual action), or water some flowers (collaborative action). The installation relies on facilitating debate and procedural awareness. The RE-ORGANISE team had to convey the complexity of a circular economy in the NoordOogst area. They created a puzzle game wherein someone’s waste is someone else’s resource to be played on location and in an app. Connecting the right waste product to the recycler will complete levels. Each level is a more complex version of the circular economy, and therewith closer to reality. The physical formation of the loops and the incremental learning make this complex system tangible. The game jam showed that several key considerations are made when modelling issues into games. While there is no coherent structure to designing games for cities, these considerations are key metrics that influence the model. Strikingly, these game design assignments are approached more as problem-solving projects than as game design challenges. Contrariwise, the evaluation criteria in the game jam (figure below) were more focused on the nature of the game, while there was no mention of the modelling of the issue. This disjoint was not just in the evaluation. The teams included designers, but that meant they consisted of game designers, architects, urban planners, etc. Every design has a different approach to an issue and when modelling issues into a playful form that spurs thinking this will ultimately result in conflicting conceptualisations. As outlined above in the Problem Solving approach, there are conflicting ways to engage and conceptualise the issues. Although the process was rather disjointed, it was still valuable in that it provided a new abstracted view on the issues and provided key handles for the future. These heuristics may for instance help in creating a facilitating framework for bridging disciplinary differences. New evaluation criteria looking at the link between the game and the issue are a necessary future project as well as the link between practitioners. Functioning as heuristics, the dimensions outlined above can serve as handles to express and reconcile conflicting approaches. Addressing an urban issue through a game requires a difficult balance between the two. Often the problem and approaches are clear, but how to make it playful isn’t. Games must function in an urban context, replete with stakeholders and projects. Games can then serve to highlight unenlightened aspects of existing projects. The urban space of play is a great source of material design. The setting provides the physical circumstances and the goal. The mission is to fit the game to the actors involved. Games can explain complex systems in a variety of ways, ranging from filtered simplifications to incremental and procedural versions bordering on reality. Conveying a complex message is often an iterative and sustained project. Translating urban issues into games then rests on a new language we are still trying to learn. The future Games for Cities events can use this early vocabulary to hopefully spin some prose. City-Gaming holds great potential in addressing 21st century issues and the Games for Cities project, an initiative by PLAY THE CITY, has set out to build an integrated community, developing a common language, and supporting newcomers. THE MOBILE CITY , the Lectorate of Play & Civic Media at the Amsterdam University of Applied Sciences, and Utrecht University Media & Culture Studies department have partnered in this project in which researchers and designers explore the role of gaming for complex urban issues. Bogost, Ian. 2010. Persuasive Games: The Expressive Power of Videogames. Cambridge, MA: MIT Press. Schouten, Ben, Gabriele Ferri, Michiel de Lange, and Karel Millenaar. 2016. 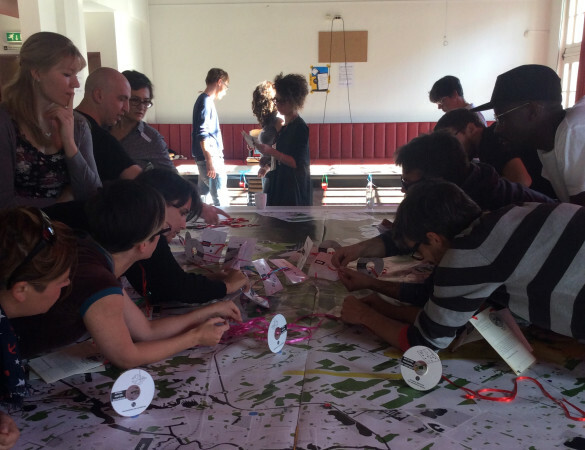 ‘Games as Strong Concepts for City-Making’. In Playable Cities: The City as a Digital Playground, edited by Anton Nijholt, 23–45. Singapore: Springer Singapore.